This residence is located in Elkridge, MD. The project consisted of additions/expansions of four sections of the home on different levels. 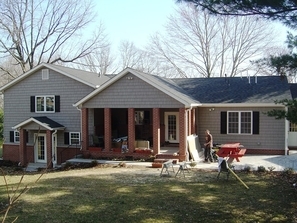 A 2-story addition was constructed at the rear end of the home, which includes a ground floor party room and master bedroom suite above. The kitchen, located in the center of the residence, was expanded with an exterior covered porch located to the rear. A 2-car garage, mudroom, and laundry room were added on the other side of the kitchen. J-Squared Architects scope of work included the design and construction documents for the project.